In the US, there are approximately 160,000 deaths from Lung Cancer each year, making it the leading cancer KILLER. 85% of Lung Cancer cases are attributed to Smoking. Hackensack Meridian Health Mountainside Medical Center is now offering a Lung Cancer Screening for individuals at high risk for developing Lung Cancer. Who is eligible for Lung Cancer Screening Program? Annual screening is covered for patients without symptoms of lung cancer aged 55-77 years who have a tobacco smoking history of at least 30 pack-years and who are either currently smoking or have quit in the past 15 years. If you do not meet this criteria, but are still interested in a screening, please call 973-426-6444 to discuss your options. How is smoking history calculated? The number of years of smoking is multiplied by number of packs smoked daily. For instance, someone who smokes 1 pack a day for 30 years has a smoking history of 30 pack-years, or smokes 2 packs a day for 15 years also has a smoking history of 30 pack years. What is Lung Nodule Program? Patients who fall outside of eligibility for Lung Cancer Screening program but have lung nodules previously detected on imagining tests can participate in Lung Nodule Program. No. Although most of our patients are referred by their doctors, patients can self-refer themselves or refer a friend or a relative for screening. Screening is Simple as 1, 2, and 3. 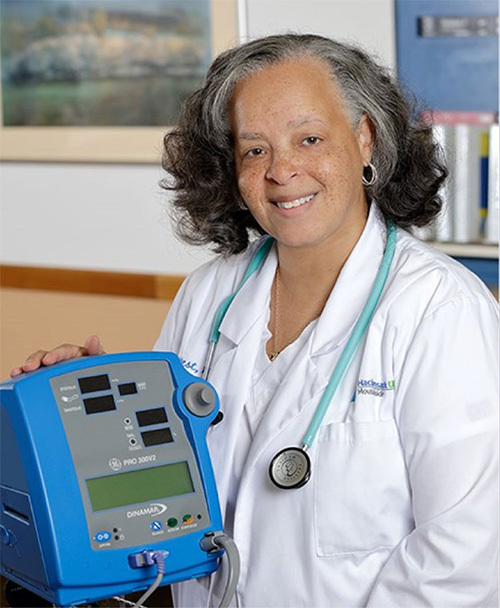 Patients can call (973) 429-6444 to reach a Nurse Navigator Linda West for Lung Cancer Screening and Lung Nodule Program, who will ask a few questions to assess eligibility and schedule a screening appointment. On the day of the appointment, patient will have a 30 minutes interview and physical exam with Physician Assistant Valentina Kolker to be enrolled into the program. After the interview, the patient is escorted for Low Density CT scan. How fast will I get the results? Official Radiologist reading is available the next day. Patient will be notified the following day over the phone by the Physician Assistant. All screening scans are reviewed by a Lung Cancer Team, including pulmonologist, radiologist and thoracic surgical oncologist. Simple screenings for those at-risk with Low Dose CT scan. Quick, safe and painless– completed in just seconds with very little radiation exposure, requires no injection and no preparation. Our Lung Center brings together a dedicated team that includes thoracic surgeons, pulmonologists, thoracic radiologists, oncologists and pathologists to provide patients with advanced care. In the event of finding a cancer, the Hackensack Meridian Health Mountainside Medical Center, a comprehensive program accredited with commendation by the Commission on Cancer, can provide a caliber of care that’s unsurpassed at any other hospital. We are in partnership with Memorial Sloan Kettering Cancer Center. Our multidisciplinary team works collaboratively to ensure that every patient receives “whole person” care that addresses all physical, emotional and practical needs and achieves the very best outcome. Advanced diagnostics using Cutting-Edge Technology in Health Care. SuperDimension™ LungGPS™ - When a nodule that requires further investigation is found on a scan, rather than a traditional biopsy, our specially trained doctors will use the SuperDimension™ system, unique state-of-the-art technology that affords greater diagnostic clarity and reduces a patient’s risk of complications and discomfort. SuperDimension™ - also known as LungGPS™ - allows physicians to more precisely locate nodules even when they are in deep, hard to reach areas of the lungs by performing a minimally invasive procedure called an Electromagnetic Navigation Bronchoscopy™ or ENB. EBUS (Endobronchial Ultrasound) - a type of bronchoscopy device that incorporates flexible bronchoscope with build-in ultrasound probe. EBUS allows for biopsy of the lymph nodes in the chest and surrounding tissue without a surgery. It provides minimally invasive way to asses if the cancer has spread outside of the lung. . Having this advanced technology on site at Hackensack Meridian Health Mountainside Medical Center enables us to arrive at a staging and treatment plan faster, with greater accuracy and less risk and radiation exposure to the patient. CT Guided Biopsy – Highly trained Interventional Radiologists can sample nodules using CAT scanners to define whether nodules are cancerous or not, as well as often clarify their genetic behavior to guide therapy. 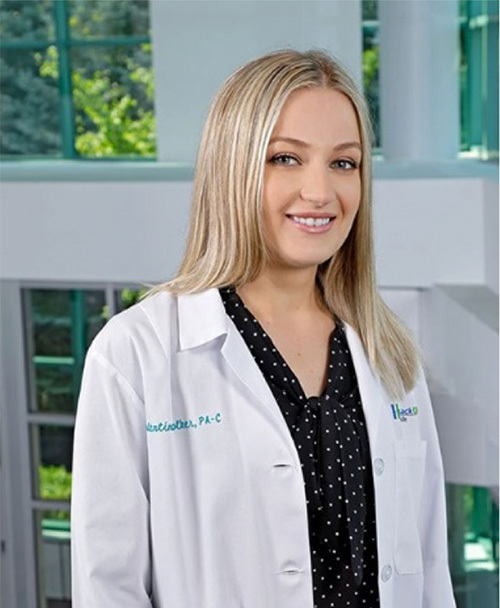 Valentina Kolker, PA is a Certified Physician Assistant specializing in Thoracic Surgery at Mountainside Medical Center. She joined the department in 2016. Mrs. Kolker received her Physician Assistant Bachelor’s Degree with honors from Touro College in 2010. Before joining the Thoracic Surgery department at Mountainside Medical Center, she specialized in Neurologic Pain Management and in Internal Medicine at Mount Sinai Beth Israel Hospital in New York City. She is an expert in the operating room as well as clinical care. Valentina administers Mountainside’s Lung Cancer Screening & Lung Nodule Program, and serves as the primary point of contact for referring physicians to Mountainside Medical Center’s Thoracic program. Linda West, RN is a Registered Nurse in the Department of Radiation Oncology. She has 22 years of experience working with Oncology patients and was awarded the prestigious Myrtle Phillips Forsyth Nursing Award in 2014. She also serves as a Nurse Navigator for the Hackensack Meridian Health Mountainside Lung Cancer Screening and Lung Nodule Program and Melanoma Survivorship Program. The Lung Center at Mountainside Medical Center can be reached at 973-429-6444.